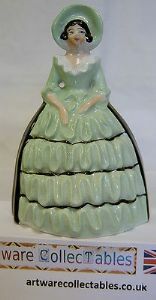 This figurine is designed as a Pepper Pot, with the lady having a medium green dress and black sashes down the sides with further black stripes around the lower body of the dress. It stands 3.5 inches (9 cms) tall and is in very good condition . There are some very minor paint flecks on the black and a little crazing on the underside. The bung or stopper seems now to be inside the figurine.